As many fathers had done before me, I had seen my oldest child graduate from high school and head off to college. My wife, Tamara, and I expected the sadness and homesickness from our child who had never lived away from home. We certainly did not expect she would be thinking about marriage within a year of moving away. I was now living every father’s nightmare of having his little girl leave home and marry some guy I had never met. It got worse. In talking to Teaghan about her soon-to-be fiancé, we discovered that she and Tyler had been fast friends when she arrived at school and had only recently discovered new romantic feelings for each other. The next discovery was that he was from Indianapolis and they were looking at getting married in April in Salt Lake City. The planning had already begun. This is when I knew I was in trouble. One of my main focuses as Chief Operations Officer (COO) of CLS is to find efficiencies in everything we do. As a company, we are always looking for ways to improve the quality of our work and accomplish more in the same amount of time. By constantly improving processes, using the latest technology, and hiring highly talented people we had become pretty good at it. Constantly improving our operational efficiency is really the only way a company can grow while keeping costs under control. Work related or not, efficiency is something I always think about – always. – And to top it all off: We were going to cook all the food and do all the decorating for the reception ourselves! Over the next few months, we planned for the wedding and reception. 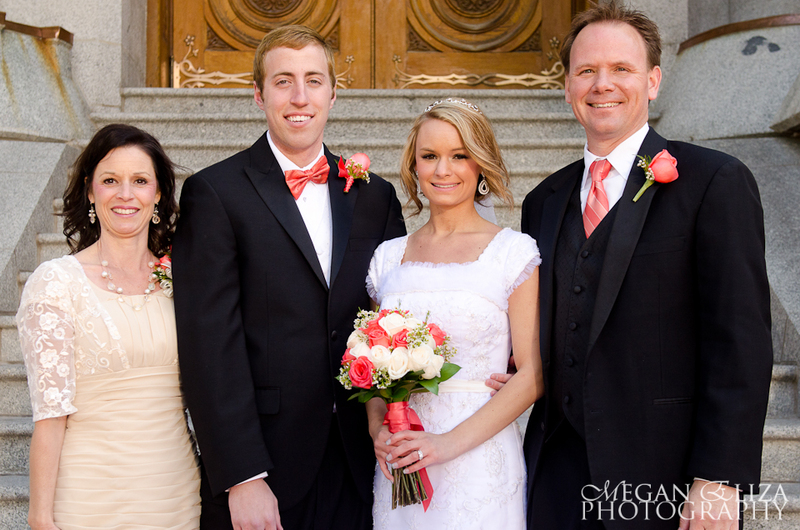 We got to know Tyler as well as we could from 1,000 miles away and slowly warmed up to the idea of having a son-in-law. We spent countless hours trying to decide what food to make and how to decorate. We arranged photographers, music, and prepared countless invitations to the reception. Of course, when I say “we”, what I really mean is my wife planned everything while I sat in the background agreeing to anything I could in an attempt to get used to what I knew was going to be an incredibly inconvenient wedding experience. Thursday April 26th: My sons, Zack and Tyler (yes, now we have two Tylers), arrive in Midway, UT and meet Tamara who had arrived a couple days before. Over the next two days we (I really did help this time) prepared eggrolls, cheese, meat, pinwheels, fruit, drinks, desserts, mashed potatoes and BACON for the wedding. Almost lost in the melee was the fact that this day was also our own 21st anniversary – not that we really stopped to notice. Friday April 27th: We load two cars to the brim with food and décor and head to Sandy, UT to drop it all off at my aunt Jeanne’s (jean-ee’s). Once done, we head back the other way to Orem, UT for the pre-wedding dinner. Thank goodness the dinner was put on by the groom’s parents. Please note that we actually drove past the dinner location and drove an extra 55 miles to drop off the food before we ate. Terribly inefficient! I actually scratched at the car window as we drove by the dinner location. Still Friday April 27th: Dinner is over. We load up and head to downtown Salt Lake City to spend the night at the Red Lion Inn. The Red Lion Inn was a great choice until I realized that it was host to a National DECA conference. That’s right, national conference. Teenagers from literally every single one of the 50 states in the union were all spending the night at the Red Lion Inn with us; although, I’m not sure a single one actually saw their hotel room. We finally got some sleep after 1:30 a.m., following a heated conversation with a DECA chaperone about the virtues of an earlier curfew. Saturday April 28th – Wedding day: We arose at 6:00am to get gas in the car and prepare the bride for her 11:00 a.m. wedding. The time finally came and we left the hotel to drive just a couple of blocks to the ceremony at Temple Square in Downtown Salt Lake City. We saw family and friends we had not seen for years. The ceremony itself was beautiful and, for the first time in years, I cried like a baby – mostly because I was happy for Teaghan, but some of the tears were because we still had to set-up all the food and decorations for the reception. After the ceremony we spent a couple of hours taking pictures with every combination possible of bride, groom, family, and friends in attendance. We quickly ate some lunch at the local KFC, sped off to pick up wedding rental equipment, and started to set-up for the reception in Sandy, UT. Still Saturday April 28th: The next three hours were spent setting up for the reception. We heated food, set out chairs, tested sound systems, prepared drinks, melted chocolate, tied bows, started the slide show, created centerpieces, set out linens, and even created two palm trees out of pineapples. Guests then arrived and everyone had a marvelous time. Between the food, the music, the party-rockin’, and the loved ones, it truly was a wonderful evening. Once it was all over, the newlyweds opened their gifts, ran through the sparklers to their car, and drove off into the night. The rest of us cleaned up and took all the presents to Tyler and Teaghan’s new apartment in Provo, UT. We then headed up the mountain back to Midway, UT to finally end the day. I looked at the clock and realized we had been going non-stop since 6:00 a.m. The time was now 12:08 a.m. What a day! Sunday April 29th: The next morning we got up (late) and started the 925-mile drive home to Omaha. The months of seeming endless planning and the inconvenience of all the driving all over Northern Utah in the end had absolutely no effect on our ability to pull off a great wedding and reception for Teaghan and Tyler. As we were driving down the highway our son-in-law took time out of his first day as a married man to call us on our cell phone. Tyler told us how sincerely thankful he was for everything “we” had done on his wedding day and that it had easily been the best day of his life. It was then I knew that despite the endless amount of inefficiencies I noted throughout the whole process, it had all been worth it.